They may have failed to bring the World Cup home, but England’s Dele Alli doesn’t seem to be bogged down by it. The Tottenham Hotspur midfielder made the most of the last few days off by jetting off to Ibiza along with his girlfriend, model Ruby Mae. Going by the photos shared by Daily Mail, the couple enjoyed some quality time on the beaches before soaking up the sun. The 22-year-old even got some back massage from his lady love as they relaxed on sun loungers. While Alli showed off his athletic frame wearing striped brown shorts, Mae looked absolutely stunning in a white-gold bikini. Alli is expected to join his club’s pre-season training soon before their first encounter against Newcastle United come August 11. 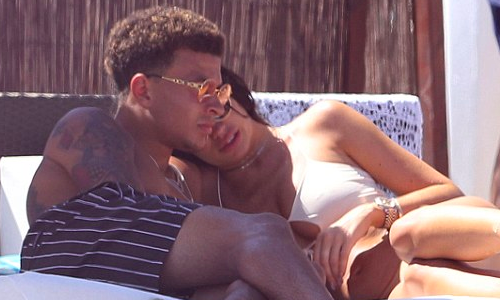 Ruby Mae enjoyed some quality time with footballer boyfriend Dele Alli on Tuesday afternoon as the pair made the most his current pre-season break in Ibiza. The sultry brunette caught the eye in a mismatched white bikini top and gold bottoms while frolicking in the ocean with the Tottenham Hotspur and England midfielder.